I believe a critical point has been lost in the responses to my lead essay. My concern in my essay and my books is a simple and regrettable fact: the epidemics worldwide of obesity and diabetes that occur whenever populations pass through a nutrition transition from a traditional diet and lifestyle, whatever that may be, to a western one. Something is causing that, and because obesity and diabetes, particularly type 2, are intimately linked to insulin resistance, we should be looking ultimately and desperately for the cause of insulin resistance. Geneticists would say we’re looking for the environmental trigger that reliably and often dramatically increases the prevalence of the obese and diabetic phenotype, regardless of the underlying human genotype. And because insulin resistance, obesity, and diabetes are all intimately linked to heart disease, that trigger is almost assuredly going to be a cause of coronary heart disease as well. Sugar and refined grains seemed to be the most likely answer to the right question, but this was swept under the rug or pronounced quackish because that answer also didn’t square with the saturated fat hypothesis. The key to all good science is understanding the question you’re asking and how it relates to the answers you need to find. And this problem is manifested once again in the responses of Drs. Guyenet and Freedhoff. Now that we’re almost literally neck deep in obesity and diabetes, the right question is vitally important to answer. If the sugar hypothesis is wrong, it is critically important that it be refuted definitively. That can only happen on the strength of far, far stronger evidence than Dr. Guyenet provides in his somewhat flip and casual response. And if the sugar hypothesis is unambiguously refuted, whatever hypothesis steps up as the next prime suspect has to be very carefully considered. (i.e., not the simplistic notion that people eat too much and move too little). We need a hypothesis that holds the promise of explaining the epidemics everywhere. In stopping an epidemic, nothing is more important than correctly identifying its cause. Where we are today with obesity and diabetes reminds me of where infectious disease specialists were through most of the 19th century, when they blamed malaria and other insect-born diseases on miasma, or the bad air that came out of swamps. That was mildly effective, in that it was an explanation for why the rich in any particular town preferred to build their homes on hills, high above the miasma and, incidentally, away from the swamps and lowlands and slums where the vectors of these diseases were breeding. But only by identifying the vectors and the actual disease agents do we help everyone avoid them and eradicate the diseases. Only by unambiguously identifying the cause can we effectively design treatments to cure it. The kinds of explanations that Dr. Guyenet and Freedhoff put forth – highly palatable foods or ultra-processed foods – are the nutritional equivalents of the miasma explanation. They sound good; they might help some people incidentally eat the correct diets or offer a description of why other people already do, but they’re not the proximate cause of these epidemics. And there is a proximate cause. We have to find it. I can guarantee it’s not saturated fat, regardless of the effect of that nutrient on heart disease risk. What is it? The more important question, and a very different one, is whether our sugar consumption has uniquely deleterious effects on our health. To refute the claim that consuming sugar might cause heart disease, Dr. Guyenet points out that heart disease mortality has dropped precipitously over the years of the obesity and diabetes epidemics and during a period when sugar consumption clearly increased (technically “caloric sweeteners” since the increase was due primarily to high-fructose corn syrup). Professor Kealey makes a similar point but with a far more nuanced perspective about how mortality rates are confounded by what are, after all, a half-century’s worth of very concerted efforts by medical researchers, the pharmaceutical and medical industry, and public health authorities to reduce mortality. That these efforts succeeded in reducing mortality is indeed commendable, but it makes it far more difficult than Dr. Guyenet suggests to derive meaning from the mortality data. If it’s evidence against the sugar hypothesis, it’s very weak evidence. Dr. Guyenet references a 2007 article that applies a statistical model to assign proportions of the declining mortality to a variety of causal factors. Aside from the usual problem with models (all are wrong, some are useful, as the statistician George Box famously put it) the authors note that even in the model they employed, the declines in mortality that they observed “were partially offset by increases in the body-mass index and the prevalence of diabetes.” This would be expected if sugar consumption is a causal factor in obesity and diabetes, as proposed in my books. Hence I fail to see how this evidence would hold up in any court, science or law, as a reason to exonerate sugar. These significant improvements in stroke outcomes are concurrent with cardiovascular risk factor control interventions. Although it is difficult to calculate specific attributable risk estimates, efforts in hypertension control initiated in the 1970s appear to have had the most substantial influence on the accelerated decline in stroke mortality. Although implemented later, diabetes mellitus and dyslipidemia control and smoking cessation programs, particularly in combination with treatment of hypertension, also appear to have contributed to the decline in stroke mortality. The potential effects of telemedicine and stroke systems of care appear to be strong but have not been in place long enough to indicate their influence on the decline. Other factors had probable effects, but additional studies are needed to determine their contributions. A minor point is that Dr. Guyanet’s chart is deceptive. Dr. Guyenet inflates the sugar intake scale, such that a modest 15 percent decline in relative sugar intake is comparable in scale to what would be a dramatic forty percent decline in the relative prevalence of obesity. In doing so, he makes the reining in of sugar consumption since 1999 look more dramatic than it might otherwise look. Had he kept the scales more equitable, we could have imagined why a modest drop of 15 percent in sugar consumption might do little to stem the tide in obesity. To help understand why not, let’s imagine a similar situation with cigarettes and lung cancer. Would we expect a 15 percent decline in cigarettes smoked per capita – say from 20 cigarettes a day to 17 – to lead to an immediate decline in lung cancer incidence or even to a stemming of the tide? And would Dr. Guyanet then conclude: “this suggests that cigarette smoking is highly unlikely to be the primary cause of lung cancer in the United States?” I’m going to go out on a limb here and say I kind of doubt it. 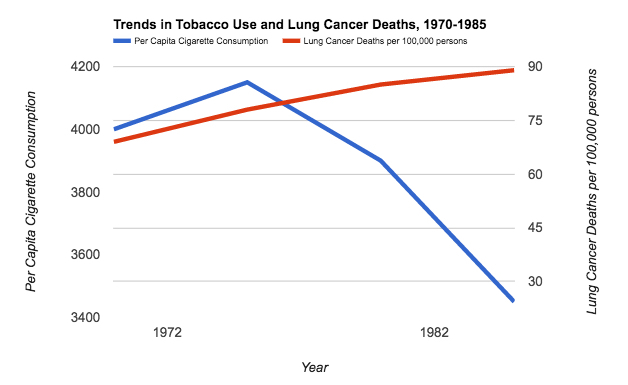 We can use a similar chart from the lung cancer/cigarette experience to further demonstrate the problem with Dr. Guyenet’s simplistic assumption that every cause has to be promptly and linearly associated with its effect. Here’s a chart, courtesy of the CDC, showing per capita cigarette consumption in the U.S. – which peaked in 1965, the year after the Surgeon General’s report on smoking and health – and per capita lung cancer rates, which took thirty years to turn over and head downward. And here’s a part of that chart blown up, using Dr. Guyenet’s color scheme, to make what Dr. Guyenet would seemingly argue is a case against cigarettes as a primary cause of lung cancer. It would indeed be nice if our bodies, both on a population-wide and individual basis, responded immediately to the removal of a toxic substance from the environment. But there are many reasons why they wouldn’t, among them being threshold effects, intergenerational effects (the passing down of a predisposition to become obese and diabetic from mother to child in the womb, as documented in the Pima population and discussed in my books) and an incubation period for development of the disease, of the kind that explains the smoking and lung cancer delay. As I noted in my 2007 book, Good Calories, Bad Calories, after studying the diabetes epidemics among local ethnic groups in the 1950s, the South African diabetologist Dr. George Campbell suggested both a 20-year gestation period (similar to lung cancer), and increasing rates of diabetes in populations so long as consumption was above a 70 pounds per capita per year threshold. Considering both the American Heart Association and the World Health Organization now suggest that a healthy diet should contain no more than about 50 pounds of sugar yearly, and ideally half that, and consider we’re still at a population level well above 70 pounds, it’s a safe bet that we wouldn’t expect a downturn in obesity quite yet from the data Dr. Guyenet provides. It’s this kind of simplistic argument and a lack of understanding of the very obvious limitations of observational and epidemiological data that I have argued in my books got us into this dire public health situation. What we all need are more informed and nuanced and, yes, skeptical discussions of what the evidence can and cannot establish to get out of it. Dr. Freedhoff takes a different tack, suggesting not that I’m simply wrong, as Dr. Guyenet does, but that I’m missing a point that is all too clear to a working physician. When he notes that there were flaws in the science of the case against dietary fat, and that such flaws are also present in the sugar data, he is echoing the points I make in my book on sugar. That I am nervous about government regulation of sugar and sugary products is at least partly for this reason. Dr. Freedhoff is right that I believe that the only way to stop an epidemic is to first unambiguously identify the cause, and my book and this article are about the possibility that sugar is it. I do not believe “ultraprocessed” foods are responsible or even a meaningful way to identify what is the cause. Certainly not, if they’re defined as “ready to consume (or heat) formulations manufactured from cheap ingredients.” If we go looking for them, which is always a good idea, we can find epidemics of obesity and diabetes in the literature in populations going back more than a century, in which such ready to consume formulations did not exist. What these populations had, though, was sugar, white flour, and maybe alcohol, and these were new additions to their diets. It’s possible that because my training is in physics and Dr. Freedhoff’s is in medicine that we just assign a different value to the usefulness of Occam’s razor in establishing reliable knowledge. I believe these historical populations, enumerated in my second book, Why We Get Fat, can be used to rule out suspected causes including ultraprocessed food, however that’s defined. Dr. Freedhoff finds them less valuable, and we have discussed this in the past. Dr. Freedhoff is concerned with the advice he should give his patients to maximize their health, which includes maximizing their happiness. I’m concerned with identifying the causes of the epidemics such that we know what has to be done to stop them. If sugar is the ultimate cause of obesity and diabetes, however, which is at least a viable hypothesis, then I can’t agree with Dr. Freedhoff that his advice to his obese and diabetic patients should not include making this fact abundantly clear. While Dr. Freedhoff’s seven behaviors may make for a happier life, they may direct the attention of his patients away from precisely those behaviors (i.e., eating of certain foods) that triggered their condition. Moreover, his claim that the behaviors he does advise will bestow “incredible health benefits” is as bereft of science as his worries about targeting sugar. I doubt we need clinical trials to suggest we’ll be healthier and happier if we get a good night’s sleep and nurture our relationships, but to assume that obese and diabetic people don’t, and to make this the basis of treatment for people who come to Dr. Freedhoff to be helped, seems condescending. We have our mothers and our friends to give us that advice. What we need our doctors to tell us (correctly) is why we got fat, and why we got diabetes, and what we can do to reverse it. And then it will be up to us to decide if we want to follow that advice. Finally, I would like to thank Professor Kealey for the kind words and his thoughtful assessment. I would take issue with one statement, which is whether or not I am the most influential journalist in the nutrition area. I would have voted for Michael Pollan in that regard, although it is possible that he might vote for me. In doing so, as he did in a recent article, he might leave it ambiguous whether my contribution is ultimately to the benefit of our health, or the harm. Gary Taubes tells a tale of unintended consequences: When the U.S. Department of Agriculture issued the first federal dietary guidelines, it may have hoped to steer Americans away from excess fat and toward a diet of whole fruits and vegetables. But this did not happen: Overwhelmingly, Americans turned to processed, sugary, and high-carbohydrate foods instead. The result was an epidemic of obesity. Meanwhile, dietary science continued to evolve. The case against fat weakened significantly, while the case against sugar strengthened. Yet scientists do not deal in certainties; their findings come with varying degrees of confidence, a state of affairs that public policy has difficulty reflecting. Stephan Guyenet says Americans can’t blame government nutrition advice for their overconsumption of sugar. Dietary guidelines issued in 1980 didn’t recommend substituting sugars for fats; they recommended decreasing consumption of both. 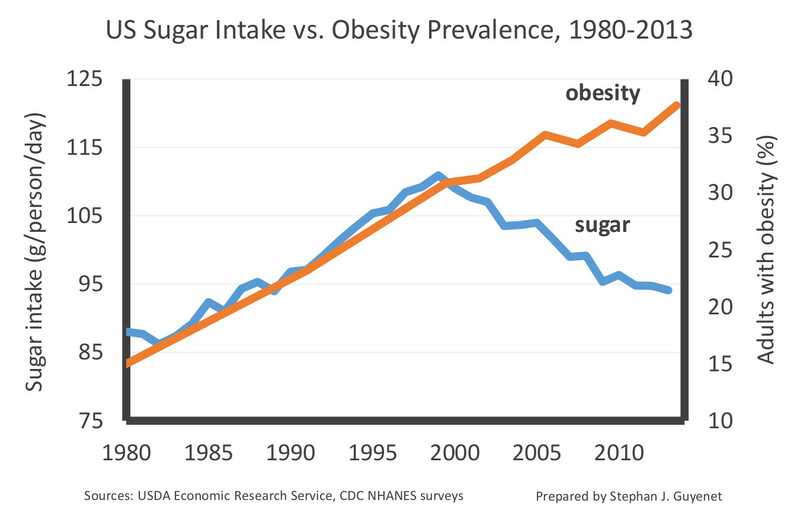 Americans, however, started eating more sugar anyway. Nor is it clear that sugar is to blame for obesity, because American sugar consumption peaked in 1999 and has declined ever since. Meanwhile, obesity has continued on a steady upward trend. Sugar is one part of a larger picture that explains American obesity, diabetes, and heart disease; it is not the sole culprit. Yoni Freedhoff says that the public policy debate about nutrition would benefit from a practical, clinical perspective. American’s eating habits have changed a lot since 1977, and while sugar is a part of that change, it’s only one part among many. Americans eat more meals outside the home. They eat more pre-packaged ready-to-eat meals. They eat larger portions. And they eat many more calories altogether. The case against fat in the 1970s and 1980s was certainly flawed, but those flaws can’t be blamed for Americans’ poor dietary choices in the meantime, and, what’s worse, today’s critics of sugar may be replicating some of the same mistakes. Terence Kealey praises Gary Taubes for being willing to submit his nutritional theories to empirical testing. Rather than trading on influence and suspicion, Taubes has articulated a hypothesis, namely that sugar is to blame for metabolic syndrome, and he has called for further research in the area: not panic, not grandstanding, but the same sort of testing that brought us to become skeptical of earlier conclusions that have now been rejected. If the sugar hypothesis is correct, it will stand the testing. If not, it deserves to be rejected. Public health and government guidelines should wait and see, and follow the research.